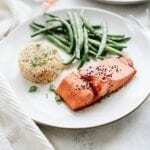 Place salmon in a shallow bowl and coat with marinade. Allow to marinate for at least 10 minutes or longer. Place on a baking sheet and bake for 10-12 minutes or until done to liking. Cook rice as you normally would, using coconut milk in place of water. Time varies according to type of rice but for short grain brown I add coconut milk and rice to a pot and bring to a boil, I cover the pot and lower to a simmer for 30 minutes before removing to let stand for 10 minutes. Add olive oil to a pan over medium high heat and cook for 1-2 minutes or until brown. Cover pan with a lid or tin foil and let stand for 2 minutes. Remove lid and add marinade and stir to combine. Cover again and let stand for 3 more minutes. Green beans should be done and ready to serve.